I spent a couple of days happily munching on my Quebec raspberries, but I realized I’d have to actually do something with them or they would go to waste. What to do, what to do? A memory of recipe for raspberry bars popped into my mind, and thankfully I had bookmarked it. 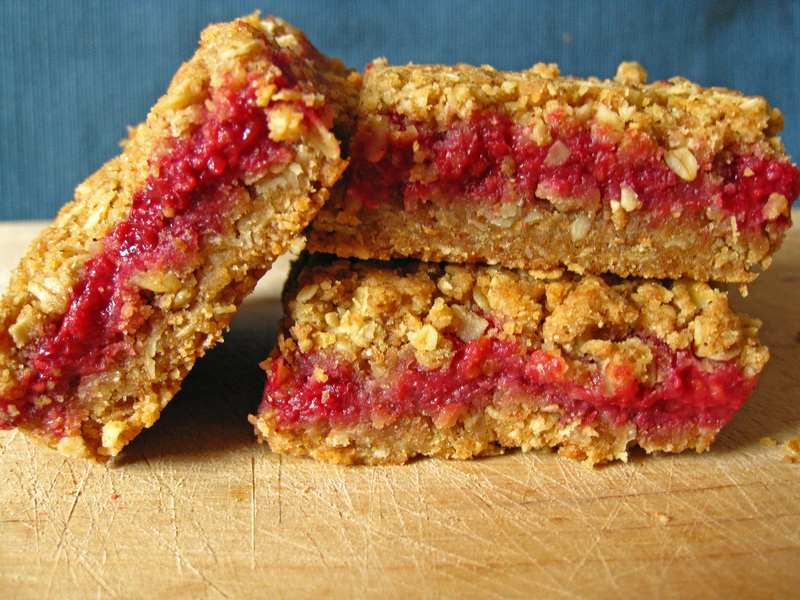 The recipe for these raspberry crumb bars is courtesy of Smitten Kitchen. I should have realized, most of my bookmarked recipes come from there. These bars were really easy to make. The recipe says to pulse everything in a food processor, but since I only have a mini one I mixed everything together with my hands. I think a pastry cutter would have worked too. I made a couple of other small changes; I swapped whole wheat flour for all purpose, cut back on the sugar, and baked them in a smaller pan. These bars are deeelicious. The tartness of the raspberries is perfectly cut by the sweetness of the oats. I had a hard time not eating them all as soon as I cut them. Press half the crust mixture into an 8×8 inch pan lined with parchment paper. Bake 12 to 15 minutes. In a medium bowl, mix sugar, flour, cinnamon, lemon juice and zest, and butter together. Add raspberries to mixture, toss gently till all the raspberries are covered. Once bottom crust has baked for 12 minutes, cover with raspberry mixture and then with remaining crumb mixture. Press the crumb down gently. Let cool completely before cutting into bars. Seriously. It will be tough, but if you cut them too soon they will just fall apart. Next > Happy Canada Day! Love this recipe! Like date squares (which are my favorite) but with a fruity filling! I adore bar cookies – yours look wonderful! I agree that Smitten Kitchen has some wonderful recipes and ideas! Your raspberry bars look delicious, I love raspberries and it looks like a great recipe! Wow…that’s a delicious bar, with gooey raspberries in the middle. Yummmmm. Great recipe for raspberries, they look good for a great snack! I love this recipe. Simple and delicious! Definitely think this is a great recipe! That looks like a cake that my grandma used to make for me when I was little. Ohh, you just woke pretty child memories to life. Thanks! These look beautiful. So fresh and vibrant. I bet they taste delish. I was wondering what I was going to make with the raspberries in my fridge! These are coming out of my oven tonight :) Thanks for the wonderful adaptation to the recipe! I just made these the other day, but with blueberries. They’re so good! These are really, truly beautiful– I’m impressed! I am also pretty excited, because I can pretend they are healthy because fruit is involved… yay! Oh, nummy nummy nummy! Those look fabulous and I’m not even that thrilled about raspberries. But I’d happily tuck into these! Want. Just want. These look incredible.